Every single colour, of every single range of carpet that we sell, is made in the Adam Carpets factory in Kidderminster. Adam Carpets test every batch of every carpet range that we make to ensure that our high standards of quality are maintained. We only use the finest materials available to make our carpets and we will not cheapen them by using sub-standard ingredients. Adam Carpets use Wool in all our domestic ranges with the vast majority being 80% Wool/20% Nylon. This has been proved to be the finest blend that you can use. In all our ranges Adam Carpets are proud to use British Wool. This wool is prized for its bulk and springy handle. It is ideally suited for carpets that will wear well and retain their wonderful appearance to give you lasting pleasure and comfort. ISO 9001 is an internationally recognised standard for quality management systems within an organisation. 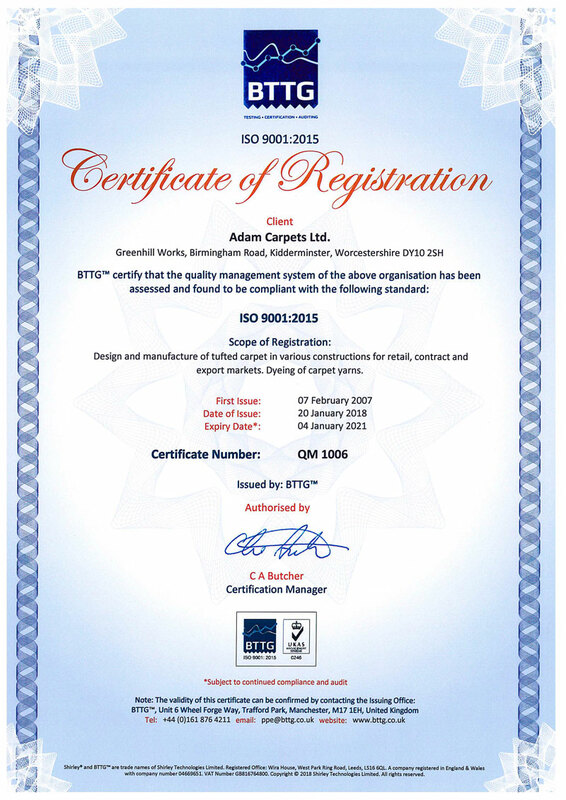 Adam Carpets operates a documented quality management system certified to ISO9001:2015 which is regularly audited for compliance to this standard. The system ensures that materials, processes, finished products and services are all of satisfactory quality. The discipline required within our manufacturing processes to achieve and maintain ISO 9001, means that we can consistently provide the highest quality products, teamed with the best possible service to our customers. 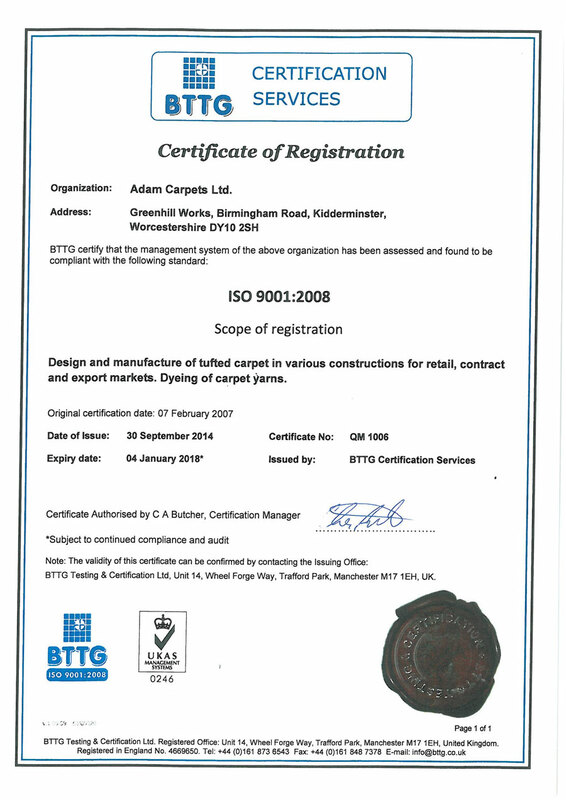 ISO 9001 also requires any company holding certification to continually strive for improvements in both goods and services – this benefits both Adam Carpets and our customers. We want our customers to have confidence in us as a company, and to be assured that our products are of a consistent and satisfactory quality. 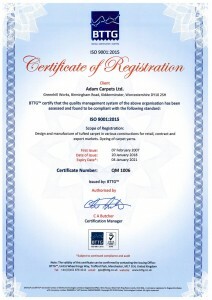 ISO 9001 is a signpost to the customer that Adam Carpets is a company committed to maintaining and improving its products and services in order to meet the customers’ requirements.